These rugged speakers deliver powerful output that'll cut through the combination of wind, water, and engine noise. These rugged speakers deliver powerful output that'll cut through the combination of wind, water, and engine noise. The weatherproof cone is suspended in a durable synthetic rubber surround for great sound and long life, and the UV-resistant polymer basket protects the entire structure. Get more out of your maritime music experience with high-performance JL Audio marine speakers. 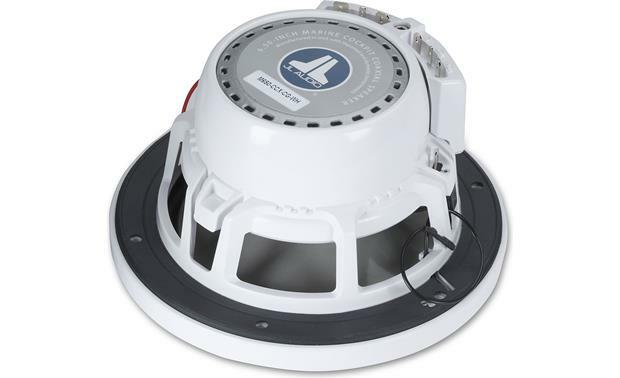 The M650-CCX-CG-WH 6-1/2" marine speakers combine durable, marine-tested design with outstanding sound reproduction. You can mount them in your boat's cockpit or bulkhead walls, either as stand-alones or in conjunction with a subwoofer. The 1" treated silk dome tweeters render brilliant highs, and they're mounted directly to the grilles for optimal sound radiation. You'll hear all the details of your music, even when the throttle is forward and you're skimming over the waves. High-quality 2-way crossovers make the woofer and tweeter work in perfect concert. You don't have to worry about mounting the crossovers — they're attached directly to the woofer basket. Do you also carry this in the "titanium (black & Grey version). Model #M650-CCX-CG-TB? It looks like we currently carry only the White version. However, I would recommend reaching out to an Advisor by phone (1-800-324-9695) or online chat to see if it may be something we can get. 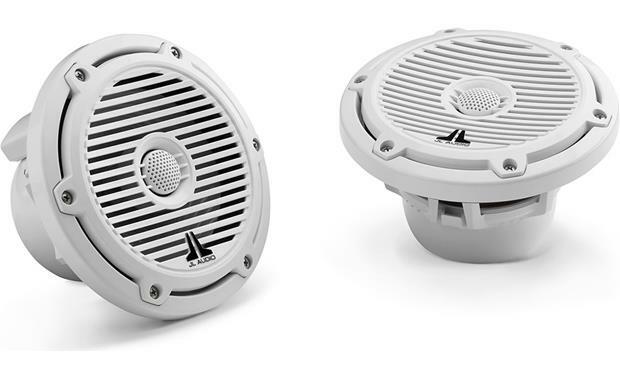 Marine Tested: JL Audio's marine speakers go through ultraviolet testing chambers (to simulate years of sun exposure) and salt fog chambers (to simulate years of exposure to salt-water environments. Woofers: The JL Audio Marine Cockpit Coaxial speaker features an injection-molded, mica-filled polypropylene cone woofer with UV inhibitors, a rubber surround and a precisely engineered dust cap profile for smooth upper-end response. The woofer uses a 1" voice coil, a marine-grade synthetic fiber spider with a progressive roll design and a vented motor structure with a marine grade stainless steel rear diffuser plate. DMA (Dynamic Motor Analysis): DMA is JL Audio's proprietary method of improving dynamic motor behavior. The DMA-optimized long-excursion design enhances output, bass extension and power handling of the speaker. Tweeters: The M650s feature a 1" treated silk dome tweeter with a specially formulated treatment to withstand UV and salt-spray exposure. The dome tweeter uses an oversized neodymium magnet for higher efficiency levels and is Ferrofluid-cooled and damped for improved response and power handling capabilities. Crossover: The JL audio marine speakers utilize a true 2-way crossover network with 1st order low-pass and 2nd order high-pass circuits. 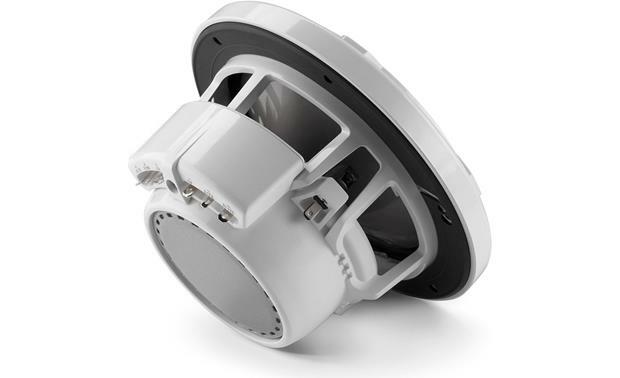 The crossover network also features a polyswitch solid-state tweeter protection which prevents tweeter failures due to abuse and resets automatically. The crossover mounts directly to the polymer woofer basket, requiring no additional mounting provision. 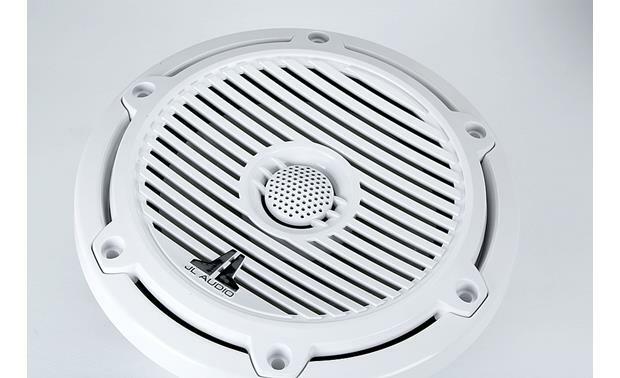 Polymer Basket And Grille: The Centrex, UV-resistant polymer basket and grille protects the speaker's woofer, tweeter, crossover and motor structure from the marine environment. Infinite-Baffle Operation: The JL Audio M650-CCX-CG is optimized for infinite-baffle operation so that it can be installed in a variety of locations, without the need for a dedicated enclosure. Power Handling: JL Audio recommends two RMS power figures for this model; 75 watts continuous power handling and 25-150 recommended amplifier power. We've listed the more conservative 75 watts RMS in the specs table. What is the minimum wattage needed to power these? Will any car stereo do? I forwarded your question to an Advisor and they responded with the following: JL says that the minimum power is 25 watts. Most any receiver will do the job. More power will deliver better performance, whether that's the receiver or a separate amplifier. If you would like to discuss further you can contact an Advisor directly by phone (1-800-324-9695) or online chat. Searches related to the JL Audio M650-CCX-CG-WH 6-1/2" marine speakers.